The arrival in Ceuta is fascinating, with mountains at both sides of the city, ancient fortresses, walls and panoramic views. Ceuta port has 2 cruise terminals: the Espana Pier and the Pier de Penitent, with tourist information and taxis. The terminal of the Espana Pier is 100 meters from the center of town. 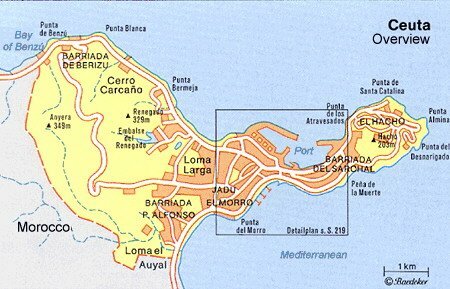 Ceuta is an Spanish enclave in mainland Morocco, covering an area of 19,7 km². It is administered by the Cádiz Province. It is one of two remaining fragments of long established Spanish presence in North Africa. Once a popular destination for the Portuguese (and other) to take advantage of duty-free, with the integration in the European Union, Ceuta has lost much of its charm. But it is still interesting the mix of an European people and organization with their neighbors from Morocco. The historic signs of colonization provide an interesting tour and, if you search for strong sensations, just cross the border to Morocco. The medina is filled with beautifully white-washed and tiled buildings. It may be wise to employ an official guide from the tourist office to lead you through the medina. The tourist office is at 30 Rue Mohammed V.
Tetouan is 30 min (40 km) from Ceuta and Tanger 1 hour.